Introducing a new cat or kitten to your resident cat can be quite a daunting situation. One thing you don’t want to do is just put them together without any thought or preparation. 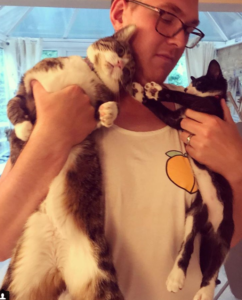 If you introduce the cats too soon or without easing them in they can become very hostile due to the fact that they might be feeling threatened or scared. 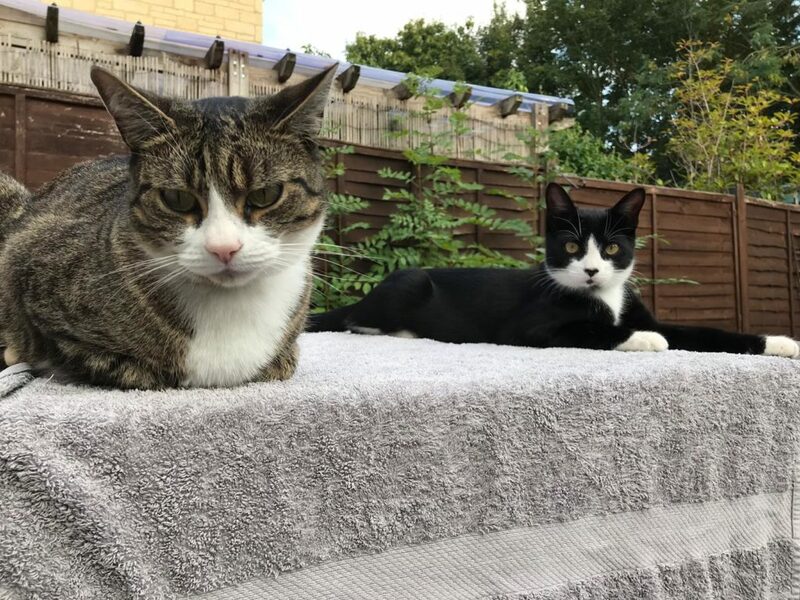 One thing to note particularly with cats is that once they feel this way about another cat it can be very hard to change their minds, hence why a cautious and slow introduction is the best way to ensure both animals feel safe and happy together. Unlike many animals and humans, cats don’t actually crave companionship from one of their own. They are perfectly happy being the only cat in the house. This isn’t to say they won’t enjoy the company of another cat, it’s just they don’t have that need or desire for company that you are used to seeing in other animals. 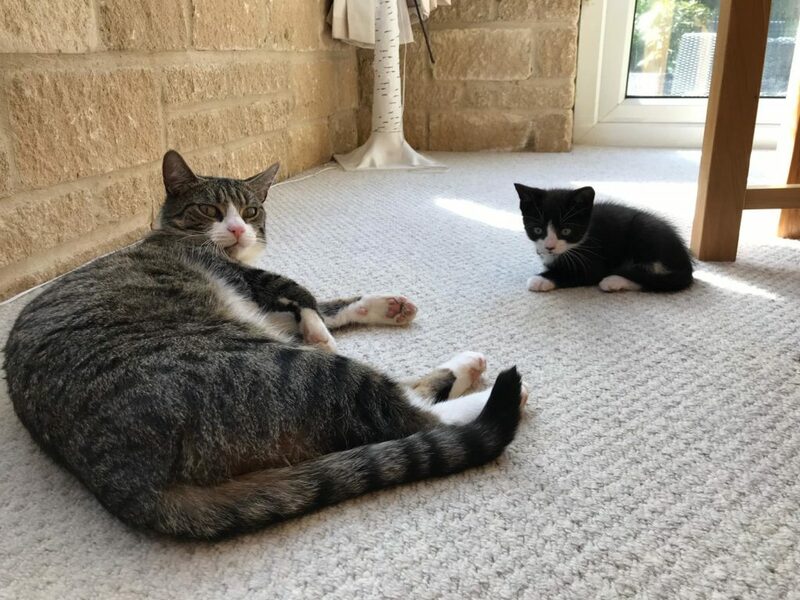 Introducing a new kitten to an existing adult cat might be easier as the older cat might not feel as threatened, due to the fact that the kitten isn’t sexually mature. However, it is worth noting that a kitten will be very lively and playful which for a resident older cat might be quite stressful so it’s important you give your existing cat some down time in a separate room to chill out. Initially it is best to keep the cats in separate rooms of your house. One in the living room and one in the spare room for example. Place all the items your new cat will need in this room, litter tray, food, water etc. Make sure there is no competition for food, litter trays and sleeping areas. Create safe separate spaces for both of them to co-exist. Cat diffusers- These can be used a couple of days before you bring your new cat into the home, these are designed to emit pheromones which relax and soothe your cat which makes them feel safe and secure. If you are introducing a kitten, you can use a dog crate for the initial stages. Top tip: get your kitten used to the crate before you place the kitten in the same room as the resident cat, you can do this by using it in a separate room with the door open for the kitten to become familiar with the crate. Height is another great asset for cats particularly when they’re feeling scared or threatened. Make sure there is enough high areas or places in your house for the cats to access to give themselves a bit of time to calm down. Cats have a good sense of smell, therefore unfamiliar scents can be stressful for them, especially when they know it’s from another cat. The idea of scent swapping is an easy but super effective way to safely get the cats familiar with one another. 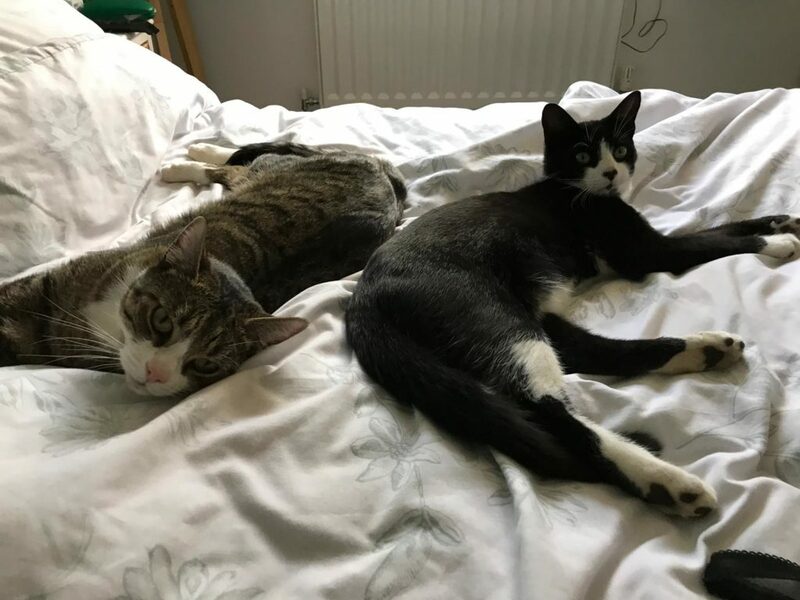 Try swapping their bedding nightly also stroke both cats separately but don’t wash your hands in between, this will cause their scents to become mixed up and they’ll start feeling more familiar with one another even before they’ve met! 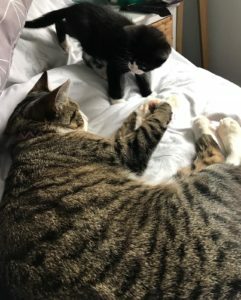 Common ground- for initial introductions you want to make sure that the cats are meeting in a neutral area that’s not assigned to either of them but ensure that they have access back to their own safe spaces if they want to leave. In this time, initially just leave them to it, they will assess each other from afar and when they feel comfortable enough to approach each other they will. Try to refrain from picking them up and forcing them to be closer together. 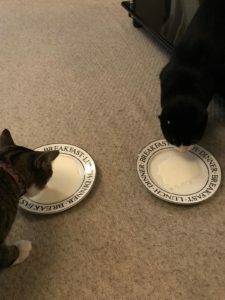 One great way to start the cats bonding is to feed them both at this time, in separate bowls but with a good enough distance between them. Hissing and moaning isn’t unusual but it just lets you know where they are at, perhaps slow the process down and keep them separate for a few more days and then try again. Most importantly to create a harmonious environment for your new and existing cat is to make sure there are enough separate areas for them to eat, drink, sleep and go to the toilet, this is a sure fire way to ensure there’s no unnecessary fights!